Restrictive gastric operations, such as an adjustable gastric banding procedure, serve only to restrict and decrease food intake and do not interfere with the normal digestive process. Who is a Good Candidate for Adjustable Gastric Banding? Your BMI is =40, or you weigh twice your ideal weight or are at least 100 pounds (45Kgs.) more than your ideal weight. You are not suffering from any other diseases that may have caused your obesity. In this procedure, a hollow band made of special material is placed around the stomach near its upper end, creating the small pouch and a narrow passage into the larger remaining portion of the stomach. This small passage delays the emptying of food from the pouch and causes a feeling of fullness. The band can be tightened or loosened over time to change the size of the passage. Initially, the pouch holds about 1 ounce of food and later expands to 2-3 ounces. In this procedure, commonly known as the LapBand®, a silicone elastomer band is placed around the upper part of the stomach to create a small stomach pouch which can hold only a small amount of food. The lower, larger part of the stomach is below the band. These two parts are connected by a small outlet created by the band. Food will pass through the outlet ("stoma" in medical terms) from the upper stomach pouch to the lower part more slowly, and one will feel full longer. The diameter of the band outlet is adjustable to meet individual needs, which can change as one loses weight. 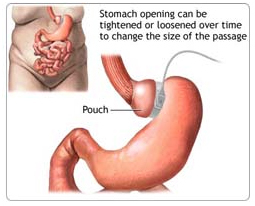 There are several weight loss surgeries available today but adjustable Gastric Band is superior to many of them. It has several features that make it the safest method of weight control. Simplicity : - The procedure is simple to perform with a short operating time. It can be placed laparoscopically without a large incision. It does not require any opening in the gastrointestinal tract that reduces the risk of infection. Safety : - There is no staple line to burst. It is adjustable and can be customised to individual needs. It is tolerated well by most persons of all ages and physical conditions. Gastric perforation : - Though this side effect has remote chances of occurrence, this can prove to be fatal for an infant during the first month after birth if the mother acquires this side effect after surgery. Intra-gastric migration : - Intra-gastric migration is a possible ramification of Adjustable Gastric Banding. This results in localized collection of pus surrounded by inflamed tissue in the anterior walls of the abdomen. Implant infection : - This is comparatively a common side effect as compared to gastric perforation and intra-gastric migration. There are chances that the abdominal wall might get infected while the small box is implanted on it. However, there are effective steps taken now to make sure that the abdominal wall is less prone to such infection. Intra-operative Complications: Includes Bleeding Gastric Perforation. Early Post-operative: This includes wound infections(1-3%), pulmonary embolism(1%), rarely bleeding & cardio-pulmonary complications etc. Late Post-operative: This includes band slippage, band erosion, oesophageal dilatation. Citrus fruits are to be eaten only upon the removal of the membranes. Such fruits include grapes, lemon and oranges. The patient is to avoid having meat, which is cut from the fleshy part of the animal because they may find it difficult to digest such tough meats. This includes chops of pork as well. Additionally, it will be better for the patient if he follows a vegetarian diet. The patient must prefer unseeded dates to seeded dates. In general, he is to avoid all kind of seeds of fruits. Food stuff that are zesty and other savories are to be avoided by the patient. Onion, white pepper, garlic and cinnamon are commonly used spices that must be used less frequently. These foodstuffs if given might be unbearable for the patients. In certain cases, even milk might prove to be intolerable. In such cases, patients are advised to have foodstuffs that are rich in protein such as butter and cheese, and to add dry milk to foodstuffs as protein supply is essential. Even though there are a few side effects colligated with the Adjustable Gastric Banding surgery, the potential benefits of the surgery clearly overshadow the negative consequences. The effectiveness of the Adjustable Gastric Banding System depends on the success of the surgical procedure and the ability of the patient to change his / her diet and eating behavior. Patients choosing the Adjustable Gastric Band System treatment have to be committed to long-term lifestyle changes, including dietary and behavioral modifications. Patients are encouraged to eat a balanced diet and to avoid the problematic eating patterns of their pre-surgery lifestyle. The restrictive effect of the band produces feelings of early satiety and longer-lasting fullness. This reinforces the patient's ability to be content with smaller meals when solid food is eaten and well chewed. At the appropriate time, patients are encouraged to increase physical activity and exercise, which is very important to weight loss, good health, and improved quality of life. Patients can expect gradual weight loss up to 2 years. Patients may lose 50 % to 60% of their excess weight within 18 months after surgery.